In part one we discussed some environments that make it difficult to deploy wireless such as warehouses, factories and open ceiling offices. 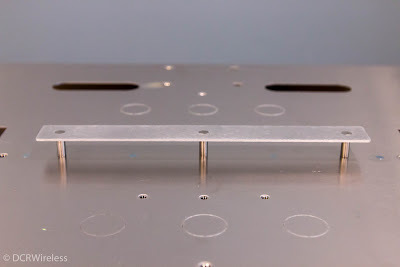 One of the major reasons that these environments are difficult to deploy in is that we need to mount an Access Point where no mounting surface exists. 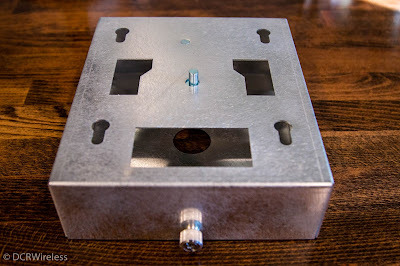 In part one, we talked about some of the hardware that we can use to hang an Access Point to help “create” a mounting surface. In this post we’re going to go over some of the incredible mounting solutions that vendors have come up with to further help finish off the mount solution. Please note this is not an exhaustive list of what is available. These are just a few options from two of my favorite providers. This is a great simple mount for areas where you need to deploy an AP with built in, or directly-attached antennas. 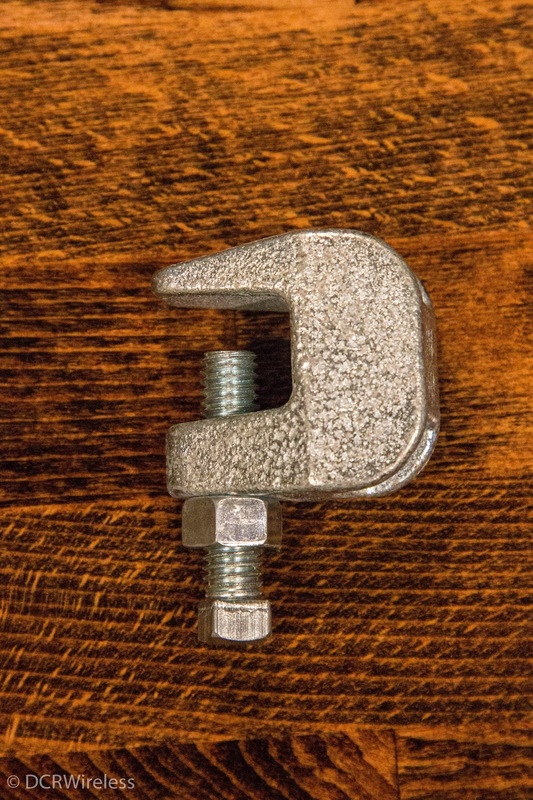 It’s made to simply mount from threaded rod. Meaning that you can hang it at any height necessary to get the AP below obstructions. Hanging from the threaded rod is simple. First determine the height that you will want the AP to be mounted from, and situate your threaded rod accordingly. The first post in this again has a couple of different mounting options to do this with. 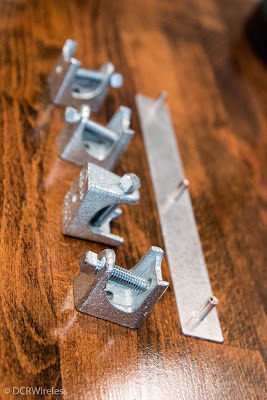 Once the threaded rod is hung, you will want to thread on a nut and thread it a little above where the mount will end up to give you some room to work when getting the mount in place. 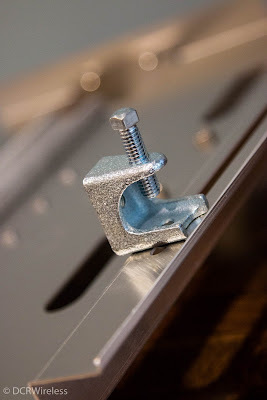 Then slide the mount onto the threaded rod through the hole in the top of the mount, but be sure to put a washer in between the nut and the mount itself. Then underneath you will place a washer and another nut. Use these to get the mount positioned at the correct height. Once the mount is correctly situated height-wise, you can tighten the nut on the top to secure the mount in place. Then its time to attach the Access Point. 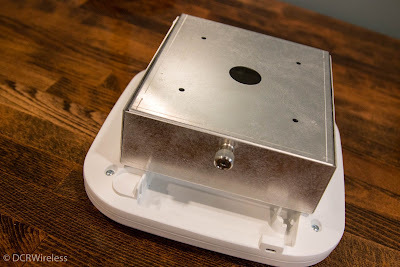 If it can be avoided, I would certainly wait to attach the Access Point until the mount is in place so that you don't drop the Access Point off of the mount while jostling the mount into position. Remember these mounts are normally going up fairly high. No reason to have a drop test of an expensive Access Point from that height. When it comes to actually attaching the Access Point, you have the four keyhole slots for Cisco Access Point feet. For Aruba Access Points, you just use the normal T-Bar bracket which attaches to the center cross-bar that you can see on the mount. Quick note - Sorry, I didn't have my Aruba 205 on hand when I took these pictures. So you'll just have to take my word for it that it works. AccelTex states that these are compatible with a number of other manufacturers other than Cisco and Aruba. However I had trouble with both Aerohive and Ruckus T-Bar mounts. The mounting section just wasn't wide enough. I've spoken to AccelTex about this and they are going to look into it. So if they ever come out with a 2nd generation of these and it has a wider mounting surface that's compatible with more Access Points, please send all the credit and accolades my way. One thing to note about this mount is that it's fairly low profile (only 4.3" tall without the AP) and unobtrusive. The fact that its painted will help it blend in if installed in many office environments as well. 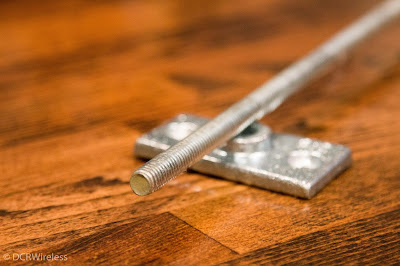 As long as threaded rod will also blend in with your office decor. I can also see this being utilized in large box stores or supermarkets. 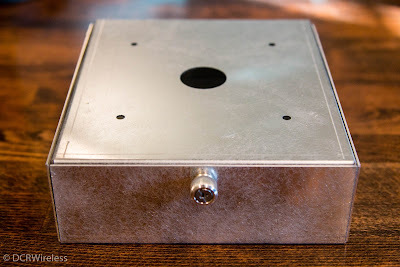 This is the previous mounts external antenna brother. It uses the same mounting method as the other threaded rod mount. However this one is built for AP's utilizing external antennas. 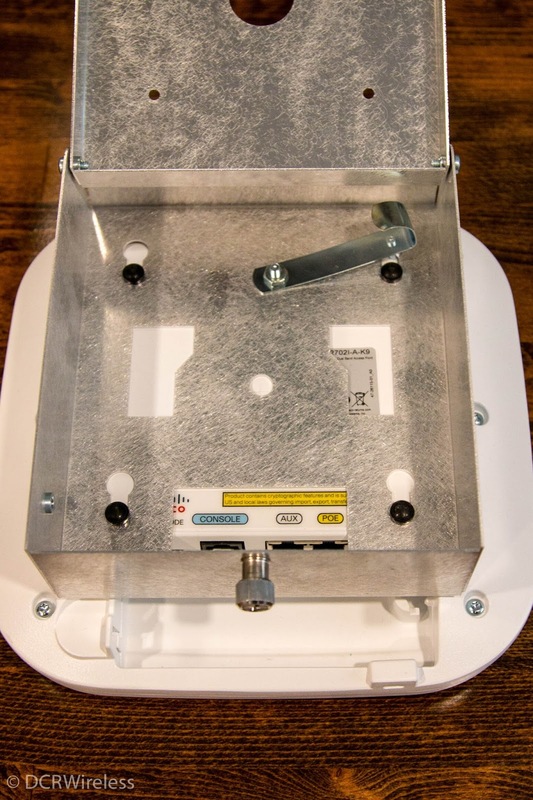 The Access Point gets mounted on the "top-side" facing towards the ceiling on this one, with the antenna being installed on bottom of the opposite side of the mount. 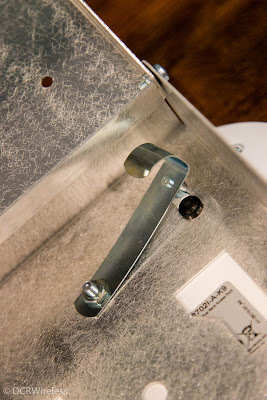 This helps keep the antenna cables on the top of the mounting bracket and above any of the antenna propagation. It also just makes it look that much neater. Pro-Tip: When installing the AP using one of these mounts. Get the mount in place as described for the mount above. But get the Access Point fully cabled with its antenna and ethernet cabling before attaching it to the mount. 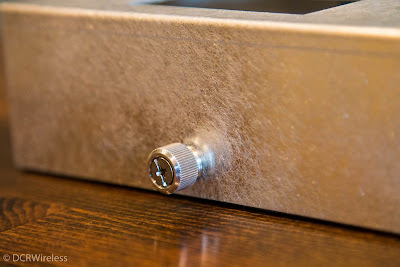 When the Access Point is attached to the mount there is very little room to slide an ethernet cable in, or to get the antenna cabling attached under the arm that the threaded rod attaches to. This is another great hanging solution for Access Points with internal or directly-attached antennas. Ventev designed this mount to be hung from conduit rather than threaded rod. Which in many places you may have all of your ethernet drops run in conduit. Plus, it means that your hanging method and cable management are all in one. With no visible cabling to the Access Point, this makes for a very clean deployment. There are a number of small things Ventev did with the design of this mount that I really like. As we go through reviewing the mount I'll touch upon these. 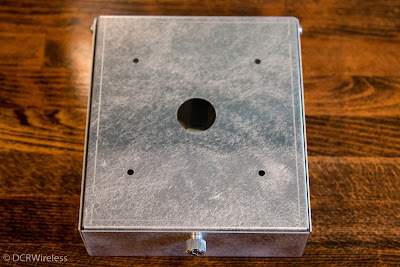 Above you can see the mounting surface of the mount, where the Access Point will actually be attached. 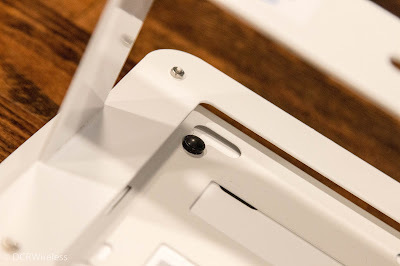 First thing you might notice is what looks like a plug or button sticking up from the mounting surface. 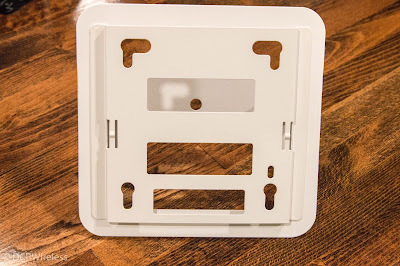 This is one of those small design features that I talked about that make this such a slick mount. We'll get into its use in a minute. Opening the mount uses another one of those really nice small touches. To open it you simple unscrew the screw you can see in the front. 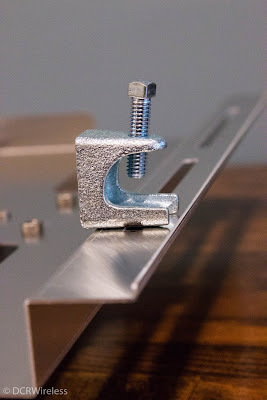 But the well designed part of this is that its a self-capturing screw (my term) that allows you to fully unscrew it to release the hinged part of the mount, but the screw stays attached to the mount itself. 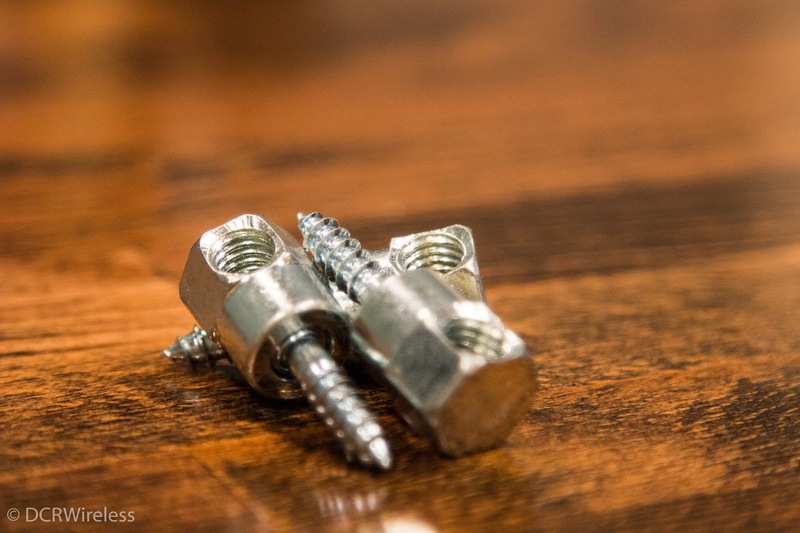 This means that while you are up on the ladder or scissor lift installing the mount, you can't lose the screw! Seriously, such a small thing, but a really nice design feature. 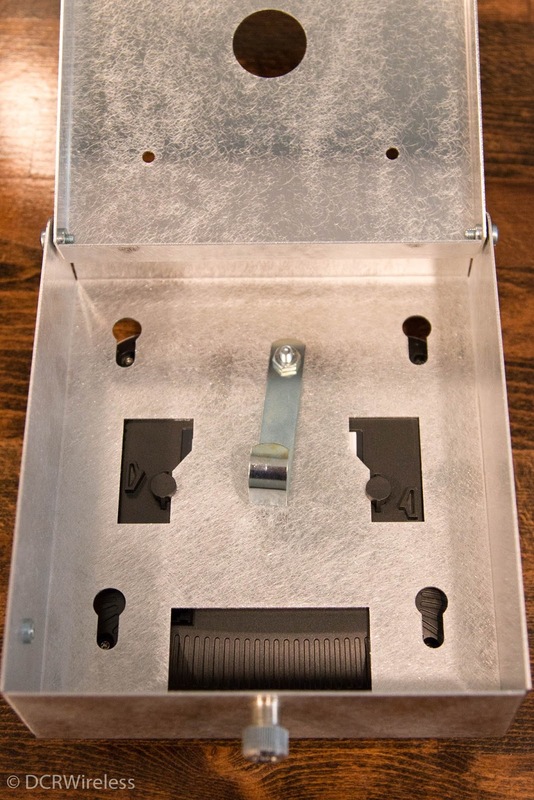 Once we crack open the mount you will see the handle on that's attached to that button we spoke about earlier. You might be able to tell that that handle looks like its designed to swivel that button. 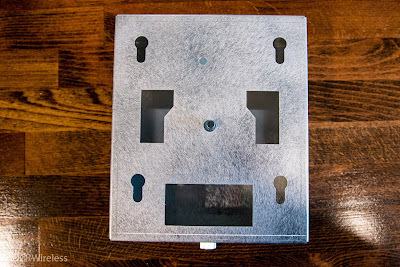 To mount a Cisco Access Point, you'll simply use the keyhole slots found on the bottom of the mount. Once in place however, we get to see where that button comes into play. 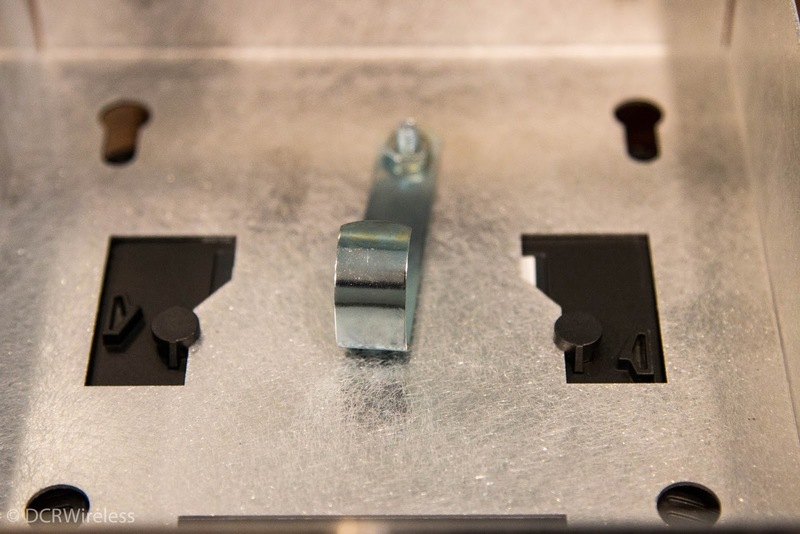 It's actually a locking mechanism to keep the foot retained within the keyhole slot! 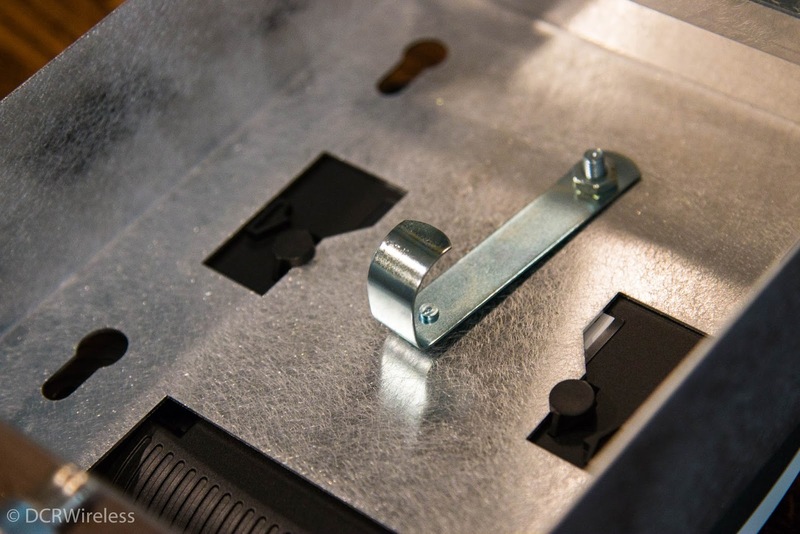 All you do is simply lift on the handle, and swing the button over to where it needs to go and it helps retain the foot.That way if the mount is bumped in any way, the Access Point will stay in place. On the bottom view of the mount you may have noticed there were a couple of other slots. 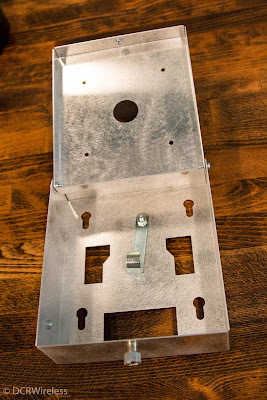 One rectangular slot for cabling the Access Point. The remaining two slots that have indents facing each other are for mounting Aruba Access Points. Whats nice about this method is that you don't need the T-Bar rail attachments. 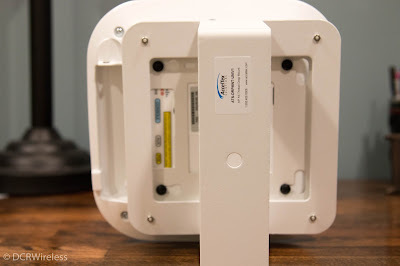 You actually use the built in "catches" on the Aruba Access points that are normally used to hold the T-Bar mounting bracket to the Access Point. This way you don't need any extra items to mount the Access Point. Also, since you are using attachment points built onto the Access Point, it makes for an even lower profile attachment. Ventev also integrated that button here as well. 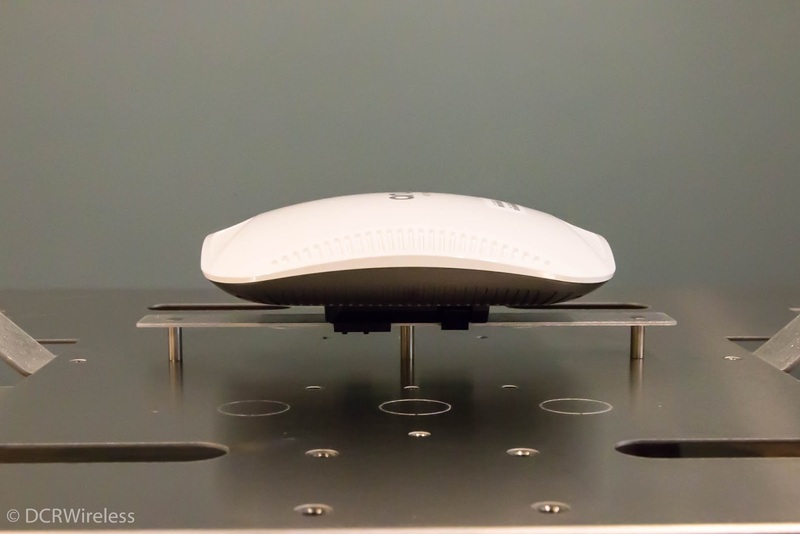 On the bottom of Aruba Access Points is a small indent that the T-Bar attachment usually pivots on. 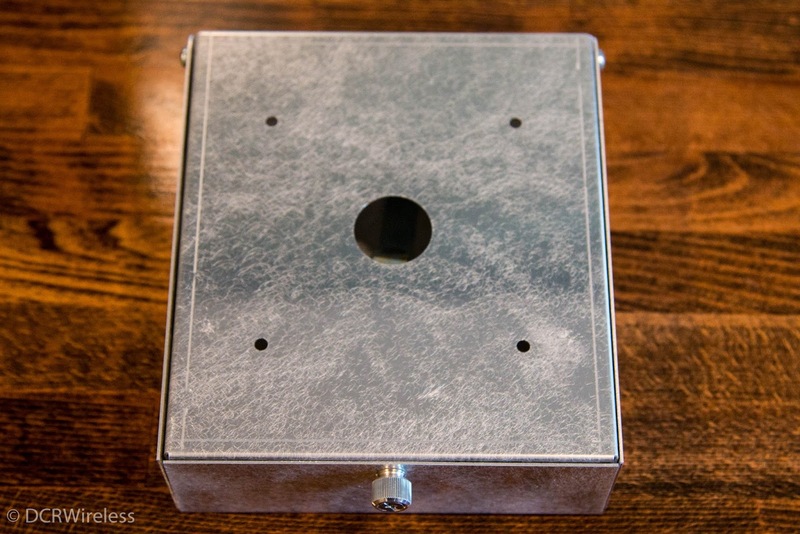 Ventev uses this hole to keep Aruba Access Points from moving around on the mount. Pretty genius! Although not everything is perfect with these mounts. 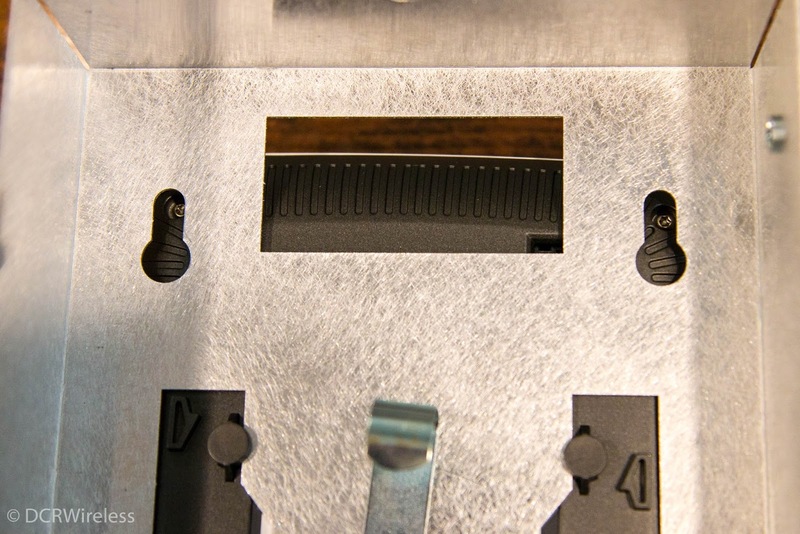 As you can see below, the mount covers the ports on the AP205. 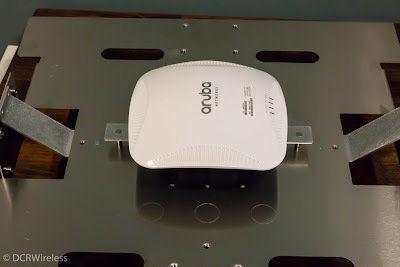 I don't have a newer Aruba Access Point on hand to determine whether the cabling slot will work with those. Their documentation seems to indicate that it will. 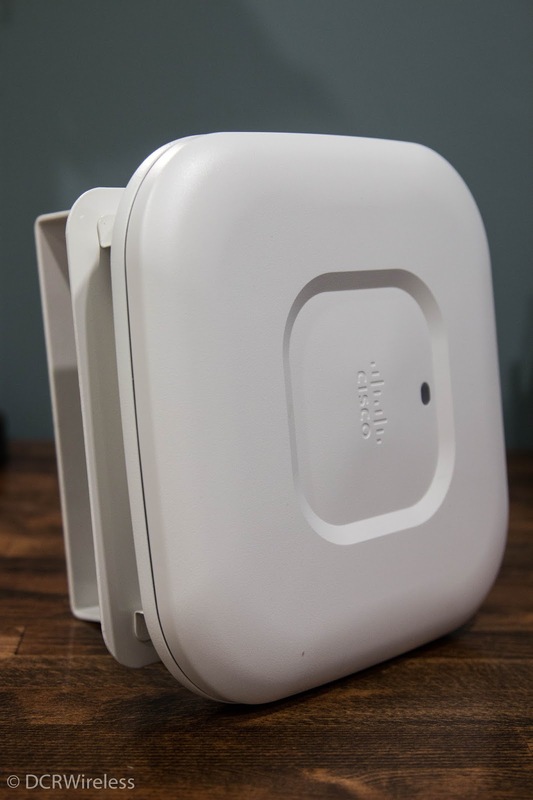 But bear in mind that it will not work with Access Points with the form factor of a AP205. We've looked at the bottom of the mount, and at the inside, so now lets take a look at the top. 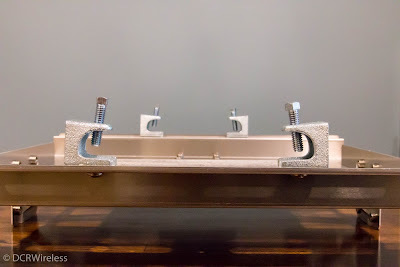 You'll notice that there is the one large hole, this is so you can slide 3/4" conduit in, and then hang the mount from the conduit using a conduit nut. If I could make a suggestion for the next design iteration of these, it would be to put an extra hole on the top of these. That way, you could also use threaded rod stuck through the conduit hole and secured using large washers. The ethernet link would then go through this proposed second hole. I guess one could always be added onsite if that's the route that you wanted to go. Looking at the bottom, or, in other words the surface the Access Point would mount to. This is a great mount for warehouses and manufacturing facilities with I-Beam construction. Often in these types of buildings we have a hard time finding a suitable mounting construction. Quite often you will see large pieces of plywood hung off of an I-Beam using large pipe clamps or some other method. Then the Access Point is attached to the plywood in some manner. Some of which are better than others. One other issue that arises from these sorts of deployments is how to mount antennas themselves. As we touched on in the first installment, we often are using directional antennas in these sorts of environments. We need to make sure that those are mounted safely, and securely so that they stay pointing in the direction that we need them. This mount solves all of that. This is the only mount of any in this post that comes with included hardware. All of the others are BYOH (Bring Your Own Hardware.) 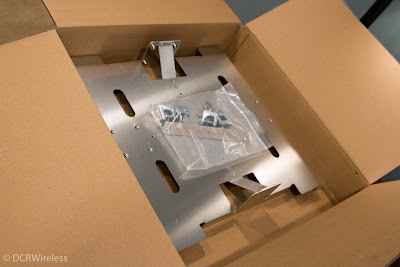 Since unboxing is all the rage on the internet, here is what this mount and its included hardware looks like in the box it ships in. Here is the bag of hardware itself. And a few more pictures of everything included in an unnecessary artsy manner. It includes four special beam clamps used to attach the mount to a beam. 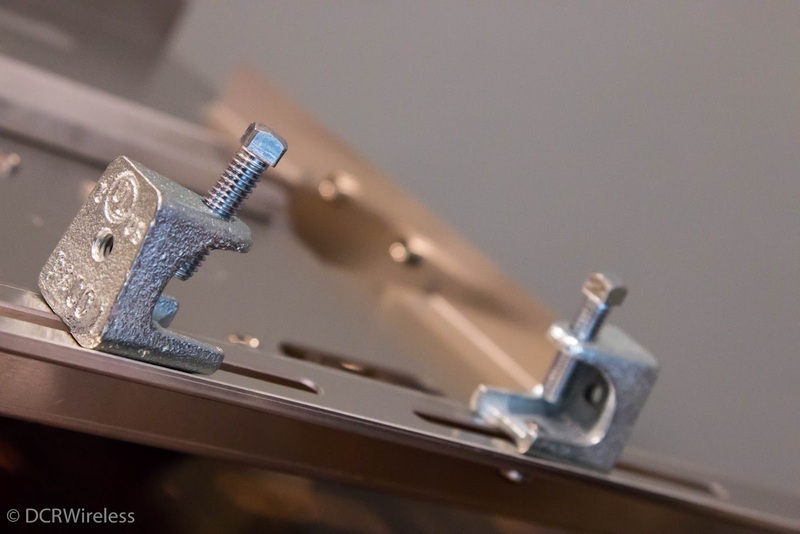 The part that makes these beam clamps special is that they have tapped holes on their bottoms and backs. 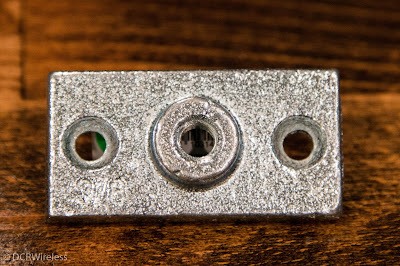 These holes are tapped so you can use some of the included screws to bolt through the mount and into the beam clamp itself. 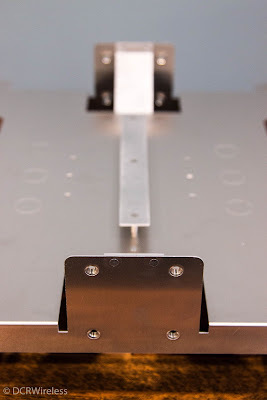 Below are a few pictures of the beam clamps installed on the mount to give you a better idea of what this looks like. In the above pictures you can see the channels that are built into the mount. 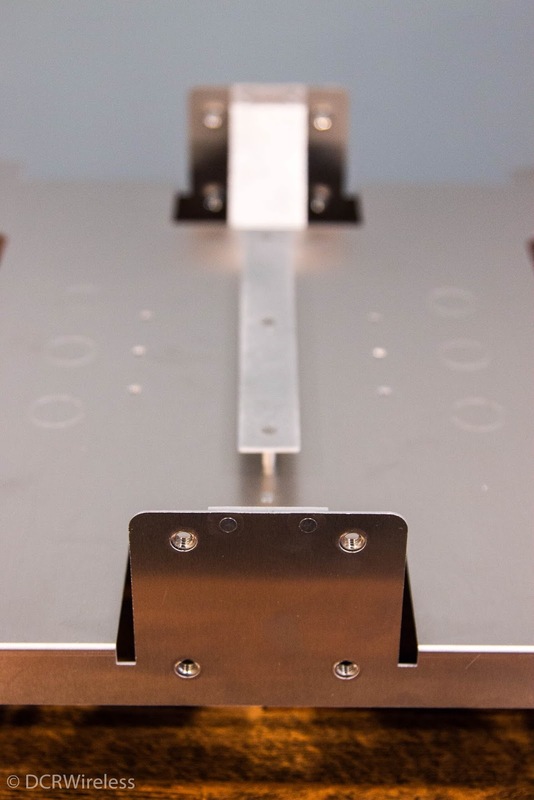 These channels allow the mount to be installed on I-Beams ranging anywhere from 3"-10". You can also see in the bottom image the screws going through the bottom of the mount and into the beam clamps themselves. Along these same lines, you can see the tapped hole in the back of the beam clamp. Again, providing you even more flexibility in how these can be mounted. 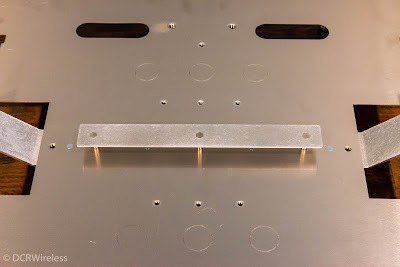 While we're on the topic of mounting these, you might also see some other large slots on the mounting surface. 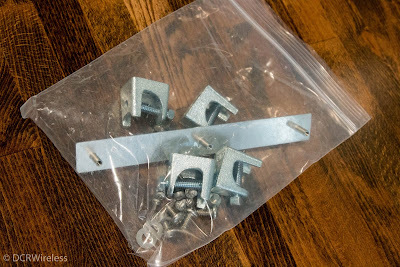 These are to place cable or wire secondary clamps wrapped around the beam, in case the beam clamps were to fail. Keeping this and everything that's attached to it from crashing down towards the floor. 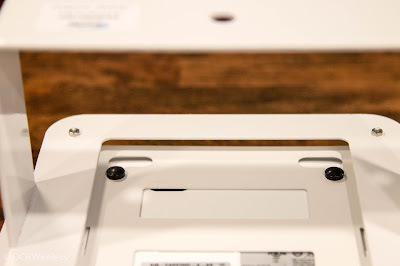 One other thing you may have noticed in the pictures of the hardware that Ventev includes with this mount is a long bar with a couple of studs sticking off of it. This is their T-Rail mount. It simply bolts onto the mount itself using some of the included bolts. This provides you the ability to use almost any manufacturers Access Points with this mount. However if using the T-Bar, I would be very careful if mounting this vertically as most T-Bar attachments weren't designed to hold an AP in that direction. 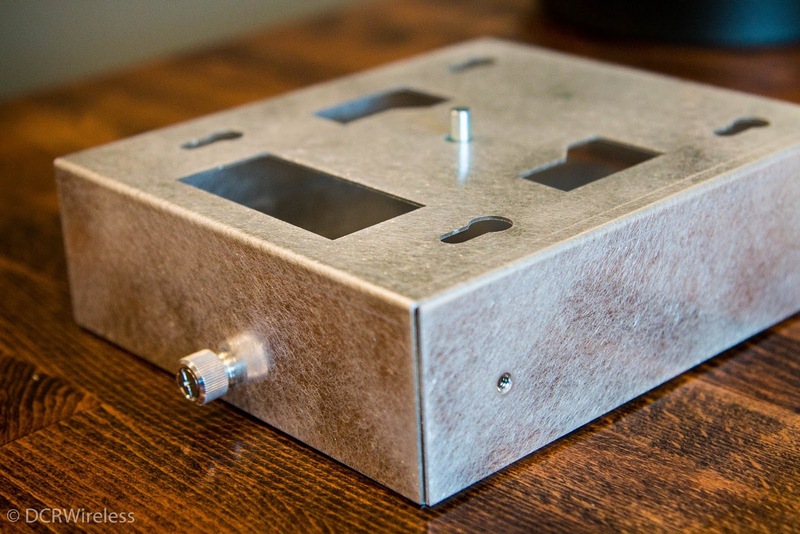 In the last picture you can see the two perpendicular antenna mounts. Often in deployments that would use this sort of mount we're going to utilize external antennas. 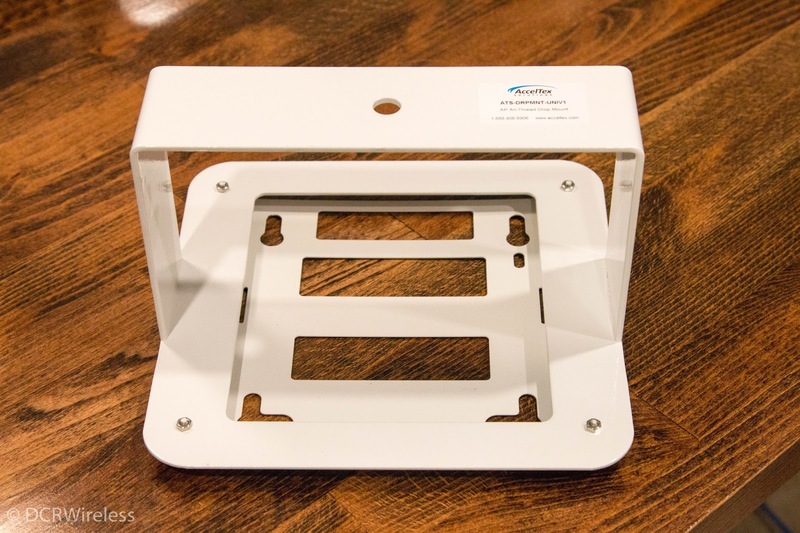 These provide you a solid mounting platform for those. One other thing to note with this mount is how large it is. Which makes sense to accommodate as many different mounting scenarios as possible. It also provides you a nice large surface area to place your signage for Access Point name and information. Normally these are being deployed in very tall ceilings, and reading the Access Point name off of a small label applied to the device itself can almost be impossible. 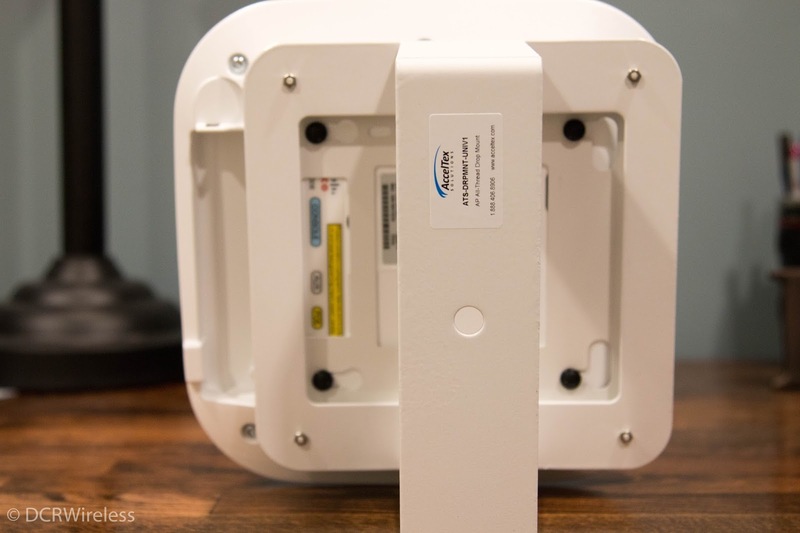 This way you can use large, bright, high contrast labeling applied to the mount itself to denote the Access Point name. An interesting side effect of this is it also provides the Access Point a bit of a shroud against dust. Obviously it isn't dust proof, but it's better than nothing. Here I threw the AP205 used in some of the other pictures onto the T-Bar to provide some scale of the size of the mount. The AP205 is certainly not the largest Access Point out there. But you can see how much more room there is on the mount. One thing these views also do is show off all of the knockouts provided that you can utilize to push cabling through. Both for Access Point connectivity, but also for the antenna cabling to feed through. Every successful deployment is first going to start with design. However that design is going to be fairly worthless if you cannot properly deploy the Access Points in the required spots called for in the design. Now we have a few more mounts available to make it easier to deploy our coverage exactly where needed. With that, thanks for reading! If you have absolutely any questions, comments, or concerns, please feel free to reach out! It seems that I can’t go a week without running into a situation where mounting the AP isn’t straightforward or easy. Whether the installation is in a warehouse, or in a factory with tall ceilings, or in a new trendy office with open ceilings and exposed ductwork and conduit. Putting the AP close to the user and below obstructions can be difficult. In the past, organizations had to come up with custom mounting solutions. Some of which were better than others. Whereas others seemed to just make the matter worse. For some excellent examples of this, check out Eddie Forero’s Bad-Fi site (https://badfi.com/bad-fi/) However luckily there has been a movement by 3rd party mount companies to create solid mount platforms to properly install AP’s in these types of deployments. We'll get into those in the next installment of this post. But first, let’s take a look at these difficult areas, and what their individual issues might be. Warehouses – Warehouses have been utilizing WiFi for a long time. However in the past many deployments were mostly for just bar code scanners. With speed and roaming being low-priority design considerations, if a design was done at all. Nowadays however warehouses are starting to take advantage of new applications that require a strong, consistent, and well-designed wireless network. Organizations can no longer have dead spots or sticky clients. They need to have wireless coverage equal to that of an office deployment. Unfortunately warehouses can be one of the more difficult places to design to that level of requirements for. Lets start off with what warehouses are designed and built to do. A warehouse by definition are buildings whose sole purpose is to store goods. To do this, they come in an incredible array of sizes and shapes. But their design aspects are mostly the same. They are normally huge cavernous buildings, many of which have hundreds of thousands of square feet. To put that in relation, an acre is only 43,560 square feet. So we have buildings whose footprints can be measured in acres. Warehouses also normally have very tall ceilings easily reaching 30ft or more. Which takes where Access Points most often are deployed (ceilings) and puts it that much further away from the client device. Also, these ceilings are supported by I-Beams or trusses, which are not the most ideal of mounting surfaces. Warehouses often store their goods on large metal racks. These racks often soar all the way to the incredibly tall ceilings we touched upon earlier. It's easy to think of these metal racks as walls when designing, especially when attempting to do a predictive design for a warehouse. However despite their size, they are open shelving. Meaning that some (much?) of the attenuation will come from what the actual inventory stored on them. This can offer issues of its own. One that I most recently saw was a beverage distribution company with aluminum cans on pallets being stored on the shelves. Now in addition to the multipath issues that the racking can cause, we have a true canyon (get it? CAN-yon?) of reflectors. As with any environment, we also have to consider the client devices and applications being utilized. The majority of devices that you will run into in a warehouse are bar code scanning guns that have minimal throughput requirements. The hardest part of these "legacy" devices were that they could be a bit "sticky." However as I alluded to in the beginning of the post, warehouses are starting to utilize new applications which require devices with more capabilities. Unfortunately these devices usually have less capable radios than their larger bar code scanner siblings. On top of all of that, VoWiFi has made its presence felt in the warehouse market. Putting stringent design requirements in place. So lets put it all together - We have incredibly large buildings, with soaring ceilings. That are filled with canyons whose walls are made up of metal shelving and inventory reaching from the floor to the ceiling. The client devices have become smaller, with weaker radios. But the design requirements have become more stringent. Open Ceiling Office – It seems like more and more office spaces are going with what I think of as an “industrial” feel. Foregoing the traditional drop ceiling, and leaving the ceiling open, exposing all of the electrical conduit, HVAC, and ceiling/floor trusses. In many cases, these ceilings are not very tall. However many organizations will try and deploy their AP’s on the trusses or against the ceiling itself, above the conduit and HVAC runs. Meaning that there is a plethora of metal between the AP and the user. Again, Eddie’s Bad-Fi site is littered with examples of this. I have also encountered the same issue in re-purposed mill buildings. With tall open ceilings, and open HVAC, cable raceways, conduit, etc between the ceiling and user. How can we overcome this? How can you mount an AP below all of the obstructions? Essentially that would require hanging an AP in midair. 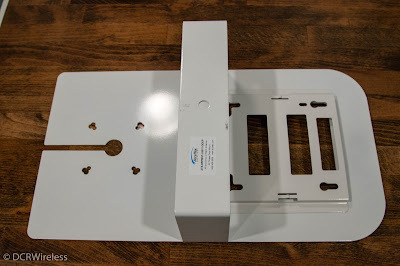 So, how do you mount an Access Point where no mounting surface exists? It's simple! You bring the mounting surface down to where the Access Point needs to be installed. We'll focus on the specialized mounts in the next post. 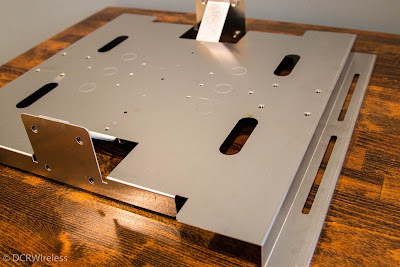 In this post however we're going to go over some of the common materials used to actually hang the mount where it needs to be. Threaded Rod aka “All-Thread” – This is the most common material used to hang things from ceilings. It’s found almost everywhere. Look up next time you are in a space with a tall open ceiling like a supermarket or large box store and you are bound to find All-Thread used to hold up any number of things, from lighting to signage to sprinkler systems and everything in between. It’s most commonly found in a 3/8”diameter with a thread pattern of 16 per inch. It comes in a wide array of lengths and can be easily cut to whatever length is necessary. One advantage of threaded rod is that it's stiff. Many customers try and hang Access Points from wires or cables. However that requires multiple "strings" to properly hang the AP, and at that point the mount can still sway if a breeze was to catch them. Cable mounts can also be notoriously hard to make level, making the Access Point off kilter, and potentially providing uneven coverage. Beam Clamp – These are used to hang threaded rod from an I-Beam or from a truss. You can find them in any number of throat sizes. They will come with a built-in bolt to use to tighten the clamp down on the surface, and then there is a nut to lock that bolt into place. Ceiling Flange – These are very simple threaded rod hangers that can be mounted (screwed or bolted) directly to a flat surface. 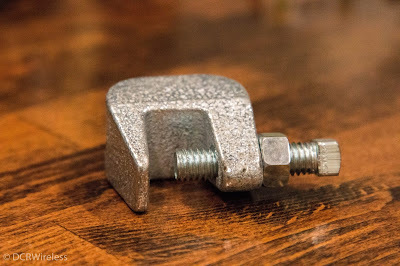 Hanger Bolts – I don’t know how these eluded me for so long. 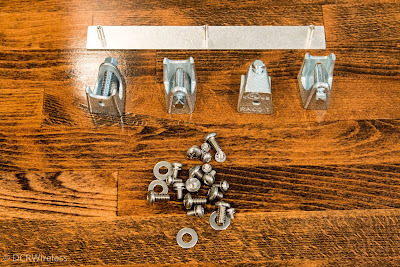 These are threaded rod hangers that have a threaded section on one end to hang the rod from, and then a lag screw section on the other end. These come in a number lag screw lengths, and can also have different hanger orientations. Whether they are holding the threaded rod perpendicular to the lag screw, or vertically in-line with the screw. The great thing is that all of these things can be found at your local large box store. In fact I bought all of these things on a quick trip to Lowes. Also, none of these require specialized tools to work with. The threaded rod can be cut to size with a simple hacksaw, otherwise all you need is a wrench or a drill to get the others in place. This also isn't to say that threaded rod is the only way to hang AP mounts, because it certainly isn't! One of the mounts we will touch upon in the next post can hang from conduit. 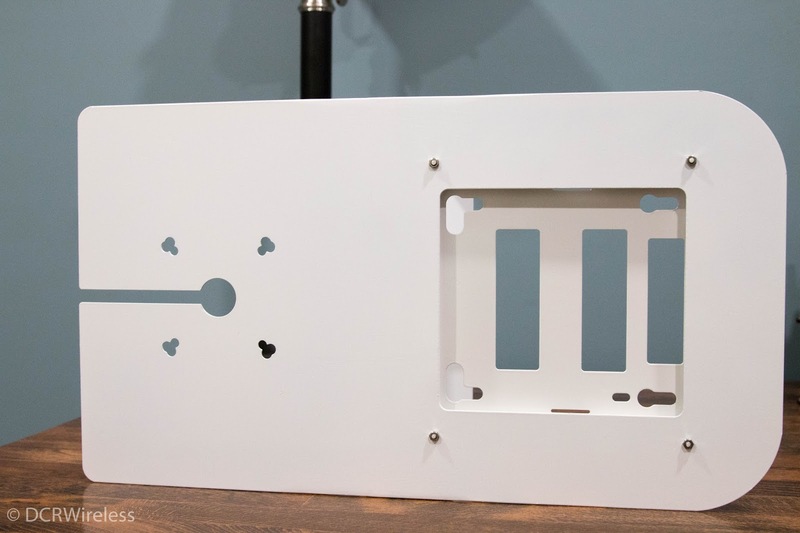 Which results in a fairly slick deployment, because your mounting hardware at that point also contains your cable management. Hopefully this helps give you some ideas on some materials you can use to provide your Access Points the most ideal mounting location. 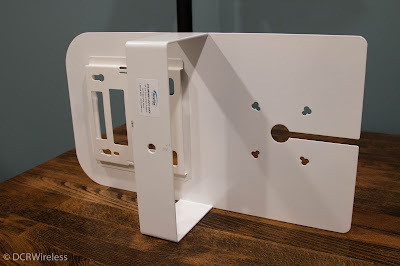 In the next post we'll talk about some of the actual mounts that you can utilize to finish off your installation. While going through school one of the things that my teachers constantly harped upon was proper study habits. Which are something that while going through school you may have developed, but now that you have been outside of school you may have forgotten. Or, your life has changed dramatically from what it was while sitting at your desk in a study hall or dorm room, you need to redevelop in a way that fits your current lifestyle and living conditions. One of the things they taught us was that there are three different styles of learners. Visual, Auditory, and Kinesthetic. Each of these three learning styles have certain strengths, and certain ways in which they best learn. Visual: These are the types of learners who need to see something to understand it and learn it. As such, these types of learners need to utilize study methods that allow them to see the content. If you are one of these types of learners you may do well with reading the book, or watching a presentation or video on the subject. Flash cards can also be an effective study method as well. Auditory: These types of learners best retain the subject when they can hear it. In High School I had a friend who was a stereotypical auditory learner. We would sit in Economics, and he would play games on his calculator (TI-83!!) non-stop, seemingly never looking up at the teacher or at the slides. However he always outscored us in tests and quizzes. Just because his eyes and hands were engaged in another activity he could still learn the content by hearing it. If you fall into this category learning from a book may be more difficult, but you can try reading aloud to yourself. You may find that if you try and teach the subject to someone you will learn it better yourself because you need to vocalize it. Although teaching a subject helps almost anyone learn the subject because you need to truly know the subject to be able to teach it. Kinesthetic: These types of learners need to “do” in order to learn. For these learners, recreating the subject in someway can help them best retain it. I somewhat fall into this category so I’ll go into this a bit more below. It’s important to note that most people learn best with more than just one of these methods. So experimenting with different study methods to find the one that works best for you is important. Remembering that you may need to pull methods from each category. I find myself being more of a Visual and Kinesthetic learner. I can read the book and retain much of what was said. However to reinforce what I see, I also need to “do,” which when studying for a subject like Wireless Networking can be hard to do. How do you “do” Inter Frame Spacing? For me, I take notes. Sometimes more detailed than others. But I find the act of putting down the content in my own words really helps me retain the knowledge. I find this is especially beneficial when it comes to definitions. For example, if I copy a definition verbatim from the book, I don’t retain it at all. Because I’m not really interacting with the definition. Merely mindlessly copying from one place to another. However when I take that definition (or subject) and put it in my own words. I have to stop and think about what the actual thing means, and how it really works. I need to truly know it to be able to put it in my own words. I touched upon earlier how teaching a subject to someone can be an incredibly useful learning method. I think this is a great example of that. In putting something in my own words, I’m essentially teaching myself the subject to the level that I can reframe it in a way that I can communicate it differently than it was presented in the book. When it comes to reading the book, as much as I love wireless, I need to set a goal for myself to get through the book. To accomplish this, and to ensure I stay on task, I made myself a tracking spreadsheet. Below is a link to the template of the spreadsheet I use. I use the Kindle versions of the books so you will see “Loc’s” rather than Pages. It’s just how the Kindle tracks it. But essentially what I do is find the last “Loc” of the book that has content on it. So the last Loc before the appendix and such. Then I update the formulas with the dates I am going to start on, and the date that I plan on ending. From there all I need to do is update it with whatever Loc I’m on at the time and it will tell me how far ahead or behind I am. As well as how many Loc’s I need to read to finish for my target date. This method works really well for me because it keeps me on task. If I am busy, or get lazy one week, it will show me how much that week cost me to get back on track. Or, if I know I’m not going to be able to get any reading done for a few days, I can use the “per day” amount to figure out how far ahead I need to get to make up for it. One of the best tools for me have been flash cards. Much like what I spoke about previously with putting things in my own words. They force me to take subjects and frame them in a way that will work on a flash card. For example, if I was to put 3dB on one side, on the other I would put “Doubles, or halves the signal strength.” The mere act of having to take that and figuring out a way of putting it on a flash card helps me retain it. Then actually seeing it when using the flash cards reinforces it even further. Another thing that I really like about flash cards is it helps you identify the ones that you need to work on further. I will run through my flash cards and the ones that I faltered on, or didn’t get right, I flag or put them in a separate pile to go through again. There are a number of online flash card utilities out there. The ones that I have used are Anki and Quizlet. Both are solid, and offer a couple of various options of going through your cards. As you develop your study methods, you will develop a bit of a flow to your studying. However if you are anything like me, that flow needs to be fairly dynamic so you can utilize it wherever you are. This is one of the reasons that I use the Kindle versions of the book. That way I always have it with me. Whether its on my laptop, phone, iPad, wherever I am, I have the book. For notes, I use Evernote. Again, that way wherever I am, I can not only take notes, but refer to ones that I have made previously. However I may move to OneNote since Evernote has put their two-device max on the free version. In Evernote I will create a Notebook for the overall exam that I’m working on. In the past I used to then create “notes” for the various chapters. However I found that many of the subjects are built upon across multiple chapters, so I have started to create notes on subject matter rather than chapter. For example, in CWDP, QoS was obviously a large subject. I wanted to have a repository of notes on QoS so I created a separate “note” just for it. That way I didn’t have to try and remember what chapter covered QoS, and if there were things from various chapters that touched upon it, I could correlate them all there. If you are having trouble retaining a subject, try reevaluating the way you actually learn. Maybe there are other methods that you can employ to learn the content. Find the methods that best suit you, then form those methods into a flow. Then get out there and get learning! In our field if you’re not constantly learning and evolving, you’re going to fall behind.